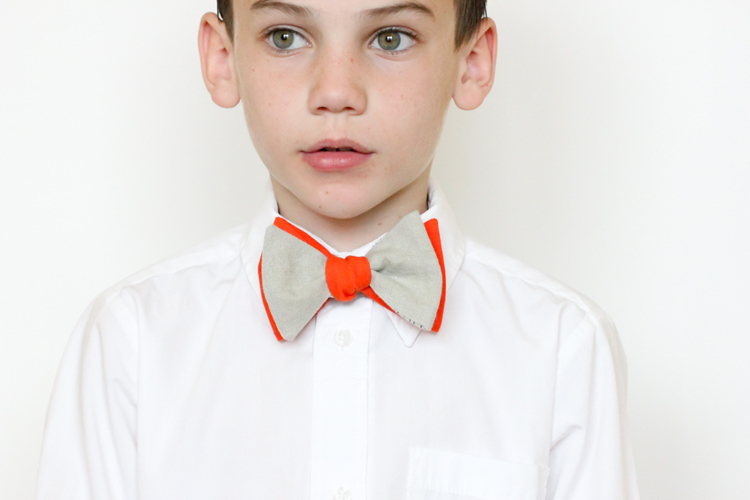 Seriously, what is cuter on little boys than bow ties!? I am a little bit bow tie obsessed as you can see HERE, HERE, and HERE. 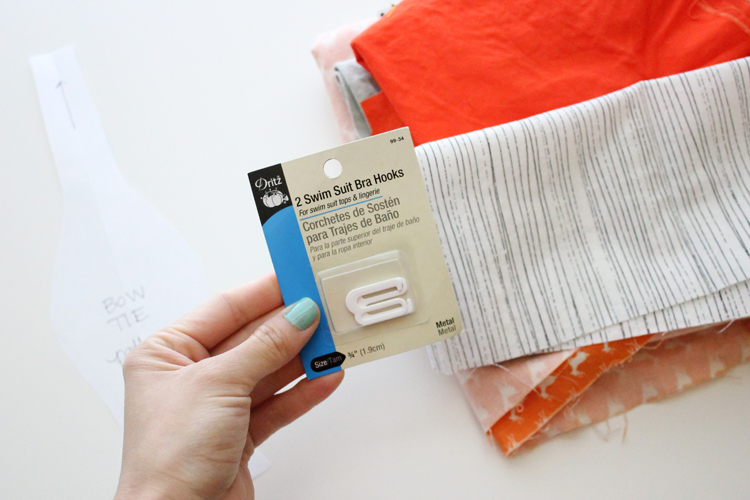 They are simple to make and are a great beginner sewing project. With only days until Easter, you can totally whip up one or a few by the weekend! 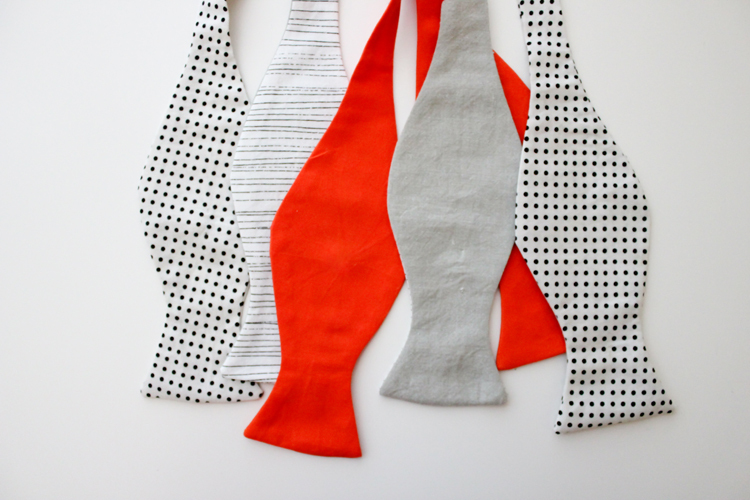 To add an extra element of design, I thought I would shake things up a little bit this time and make these bow ties mix and match. What makes these work, is that these are authentic bow ties that you tie together like the ones I posted about HERE, and they are two separate pieces so that you can mix and match them. 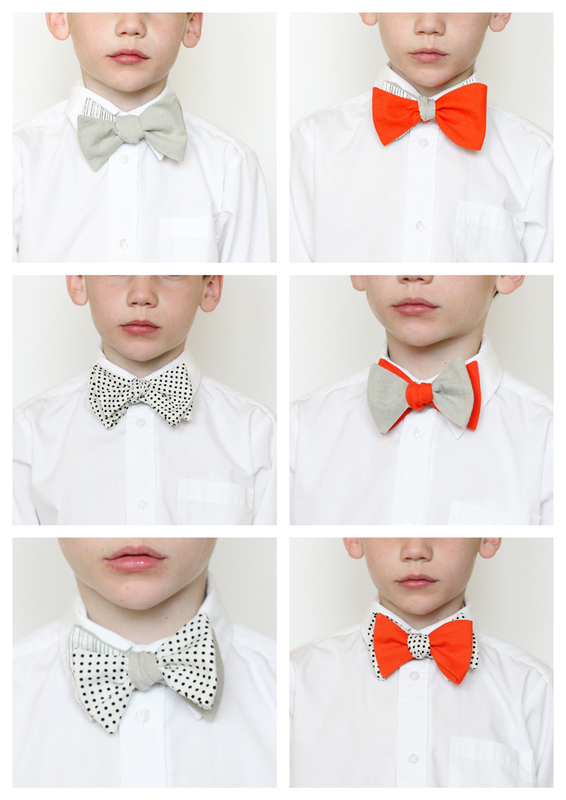 The process is the same as the Lil’ Mister Bow Ties. This time, I have just simplified the tutorial a bit and included a free pattern. *I used good quality woven cotton for all of my bow ties. I think this works fine for boys. Depending on the color and quality it may also work for men but I recommend a silk blend backed with a feather weight interfacing or wool for men. You may also decide to add interfacing to the cotton fabric. The pattern is offered through Google Drive. You may have to log into Google before you can access it. If you would rather I email you the file, contact me at delia.randall@gmail.com. Please allow email service to take up to a week. 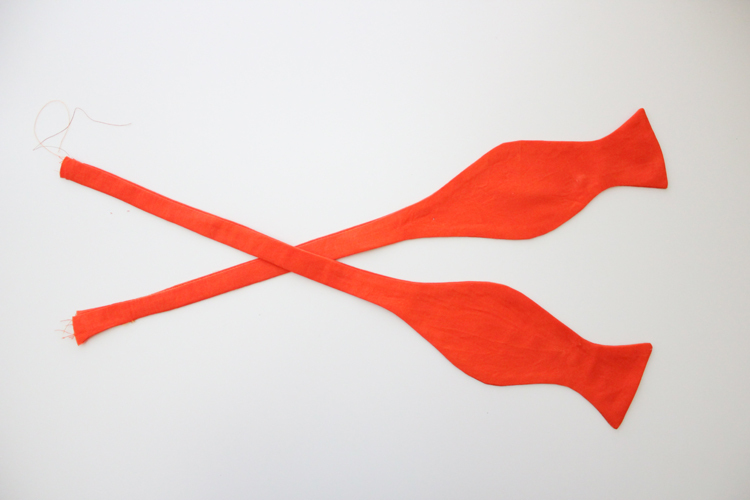 There is a sizing chart with approximately how many inches to add to the end of the bow tie pattern. 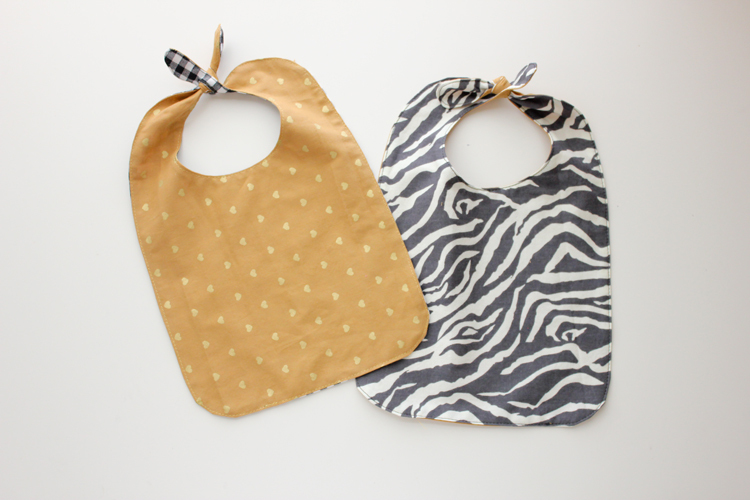 The sizing chart goes up to size 10-12 or a 14- 14.5 inch neck circumference. Please note: This is a mostly untested, free pattern. I tested the chart measurements on my two boys, so it is a pretty secure guess, but it has not been tested as thoroughly as a paid pattern. 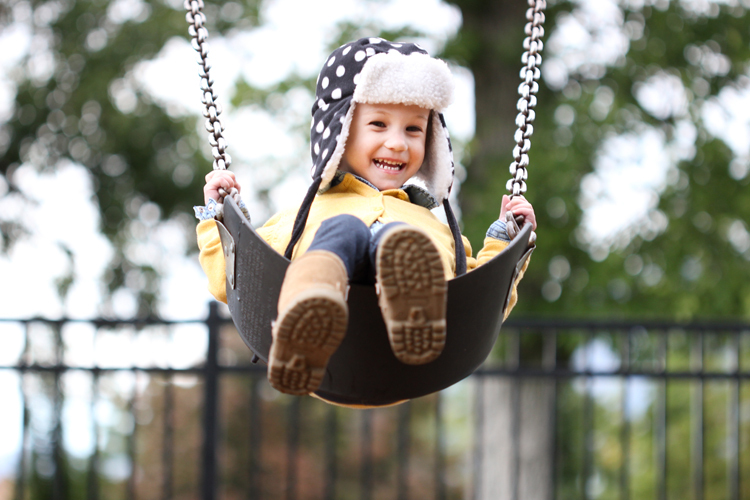 Neck sizes also vary between body types, so your child may not match up perfectly to the size chart by age. 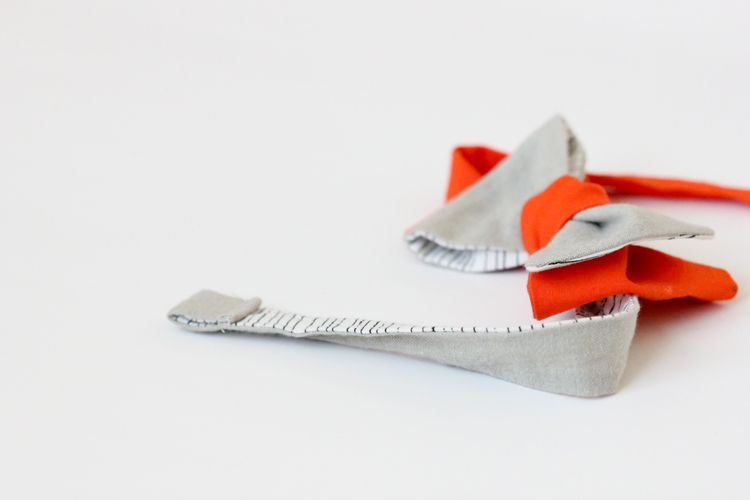 If you want to go off your own measurements you can follow the instructions I provide in my original bow tie post here. Just be sure to measure your child’s neck, around the collar, with a dress shirt on. This measurement will be a little bit larger than their actual neck. 2. Cut your fabric. You need 4 pieces (two pairs). 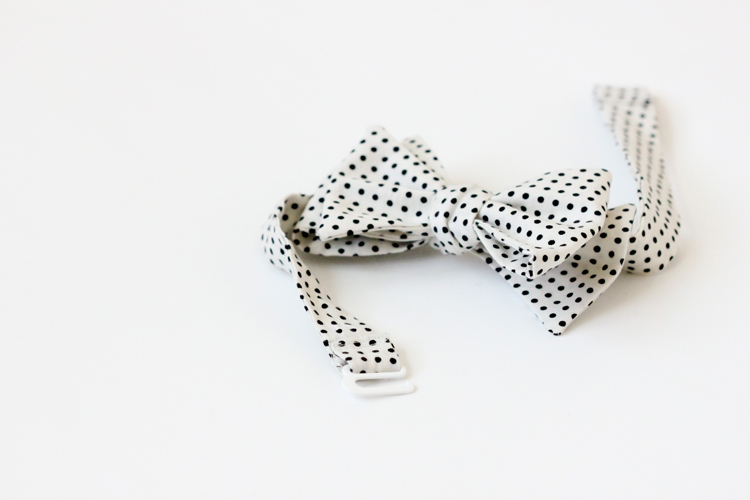 A note about grain: Bow ties are traditionally cut on the bias. If you have enough fabric to do this, I recommend it. You will not have to worry about notching and snipping curves. 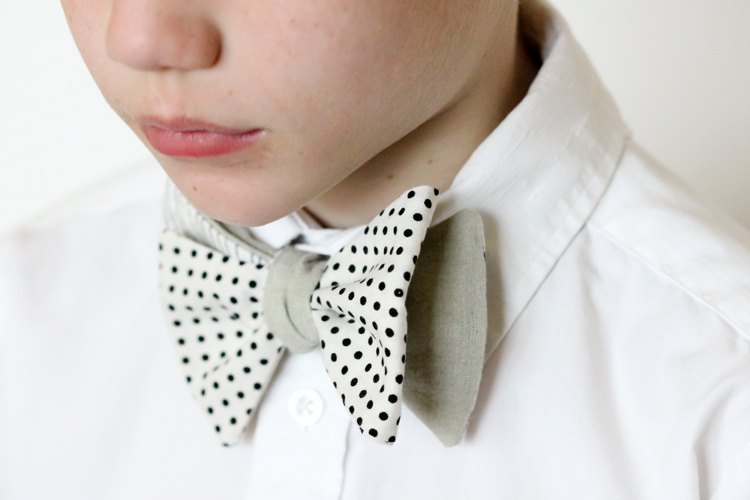 When I make bow ties for my boys, I am usually using scraps, so I don’t have enough to cut on the bias. My pictures and instructions in this tutorial reflect that. 3. Pin and sew.With right sides facing, pin pairs of the bow tie pieces together. Sew with 1/4″ seam allowance. 4. Address the curves.If you did not cut your bow tie on the bias, then snip concave curves and notch convex curves. 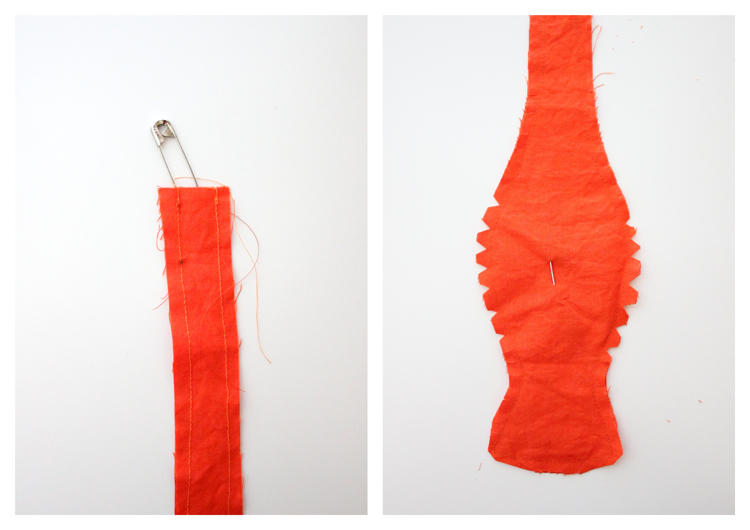 Don’t forget to to snip off the corners as well (be careful not to snip through any stitching). I like to cut the corner off and then snip into the cut corner to further reduce bulk. 5. 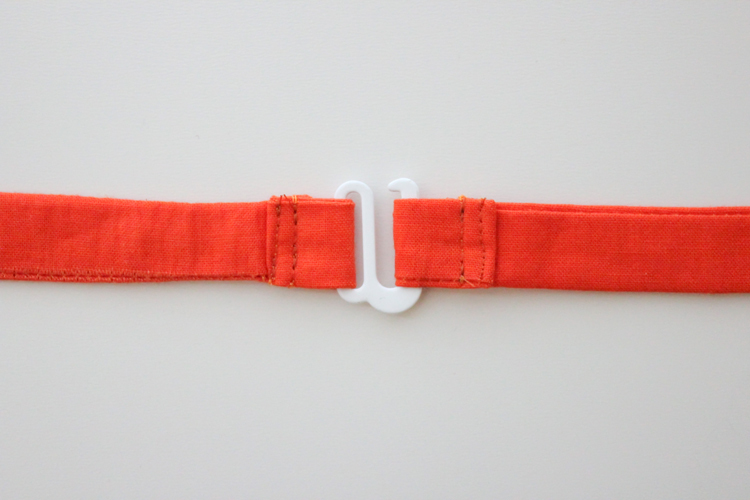 Slide a sturdy safety pin into the top and let it slide almost all the way to the bottom. 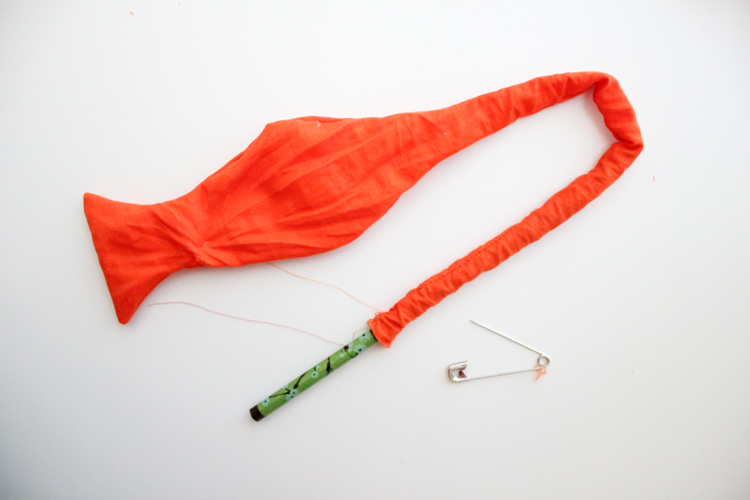 Now, hook the safety pin into one layer of the bow tie. Close the pin from the outside so that it is pinned from the inside. 6. Turn it right side out. This is the trickiest part and takes a little time and patience. 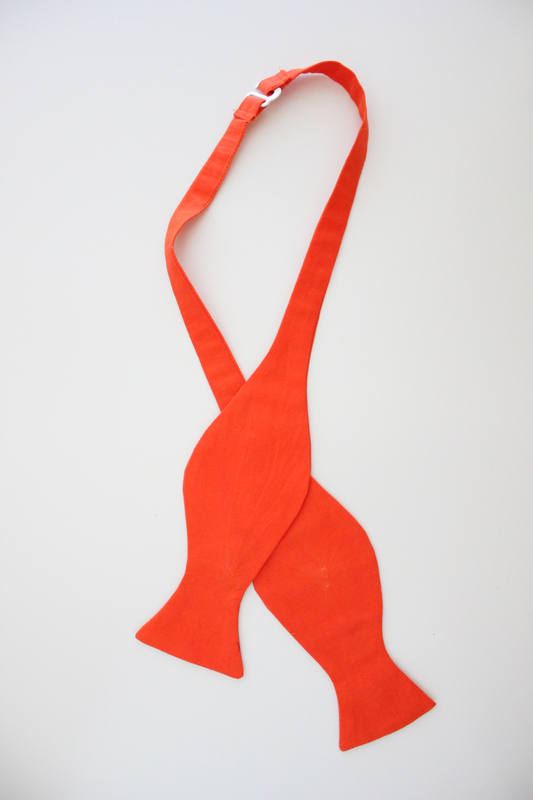 Shimmy the safety pin up through the neck of the bow tie piece and turn it right side out. Speed is not your friend. If you are too hasty, you could create some large holes and some tearing where the safety pin is. Some small holes are unavoidable, but they can easily be pressed out with a steam iron. Your bow tie will look like a wrinkly deflated balloon at this point. 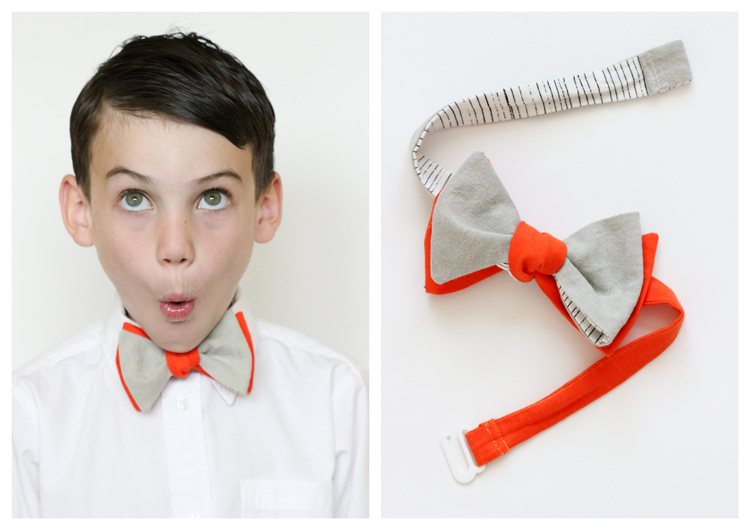 Slide a chop stick or a dull, sharpened pencil down through the neck to fully turn the bow tie out. 7. Repeat for the other side of the bow tie. 8. Iron. 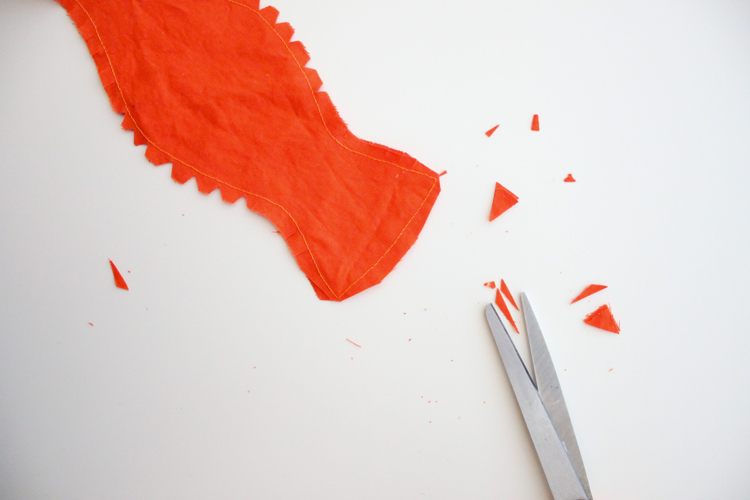 Press both bow tie pieces generously with an iron, preferably with the steam setting on as high as your fabric allows. 9. 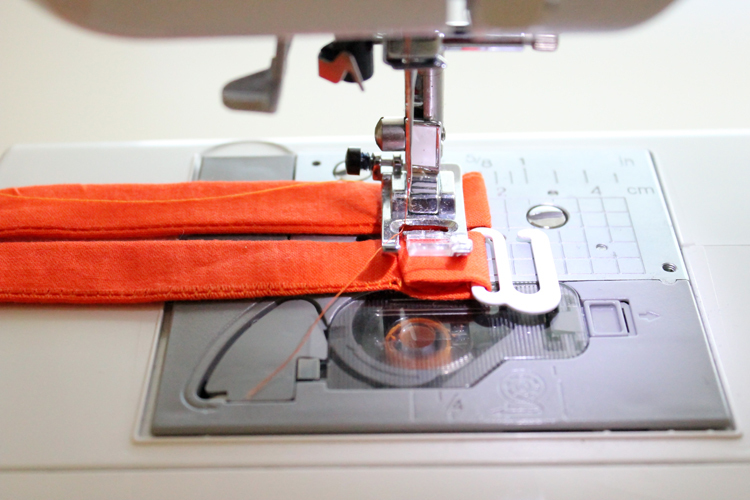 Sew your hook and loop. Slide one of the swim suit hooks onto the end of one of the bow tie pieces. 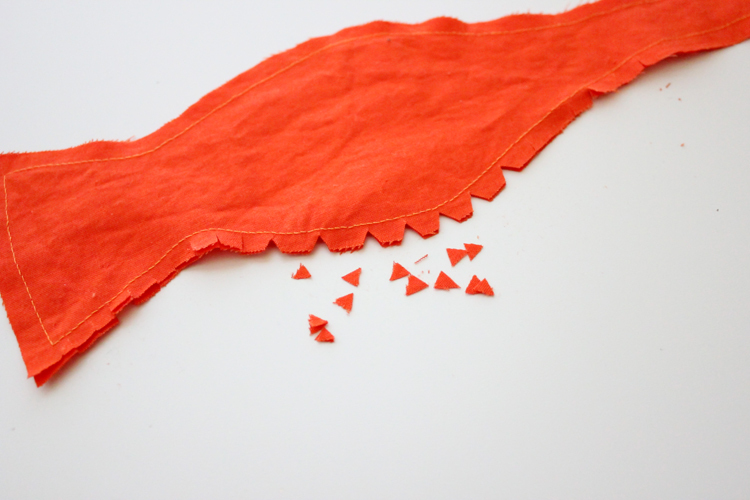 Fold the raw edge over 1/4 inch and then again about 1/2-3/4″ inch. Clip or pin and place. 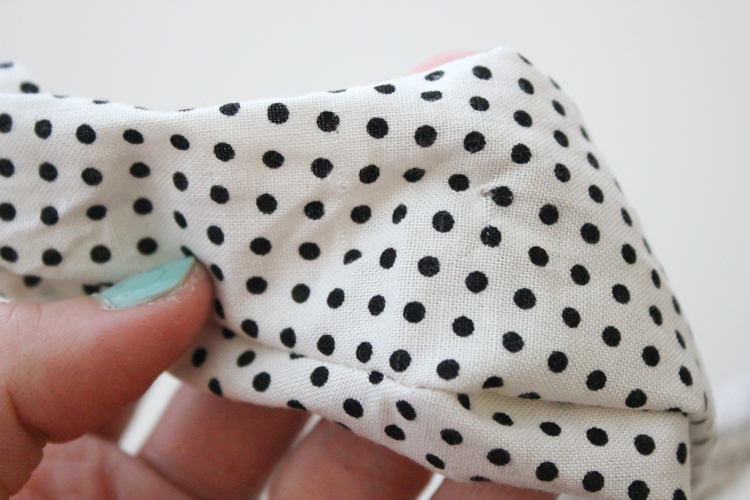 Fold the other bow tie piece in like manner. 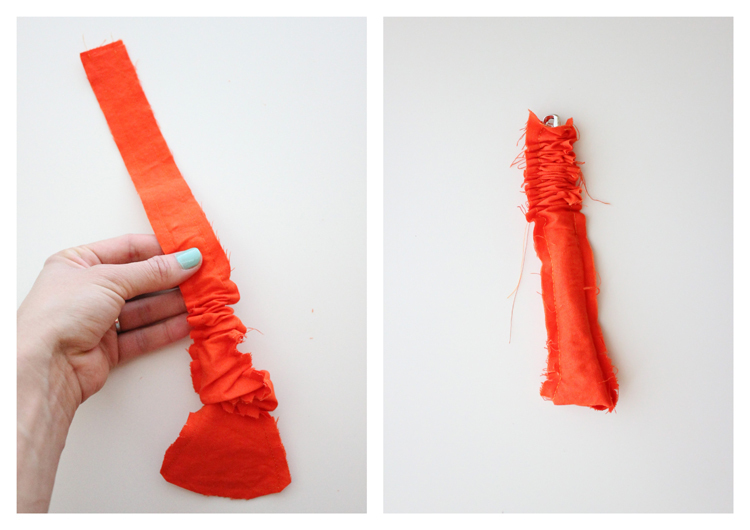 Fold under 1/4″ and then again about 3/4″. Sew folds in place with two lines of stitching. 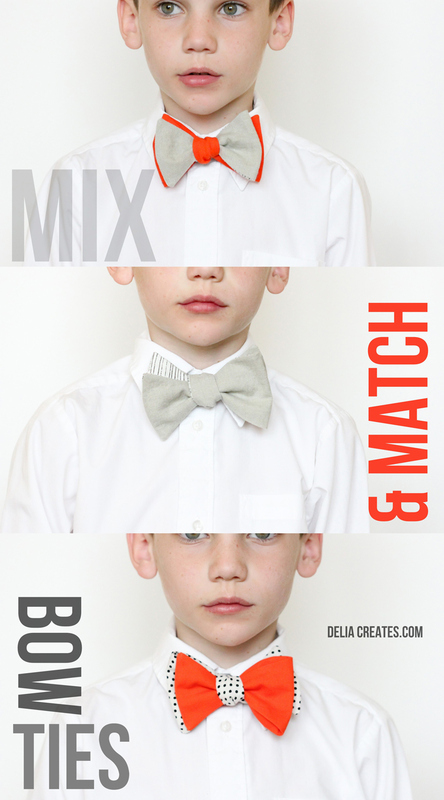 Then mix and match the two sided bow tie! 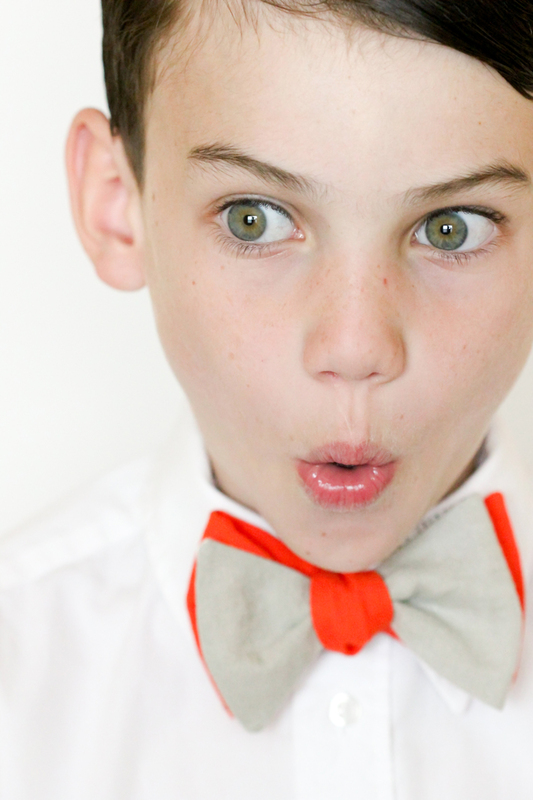 Not sure how to tie a bow tie? I’ve got you covered! 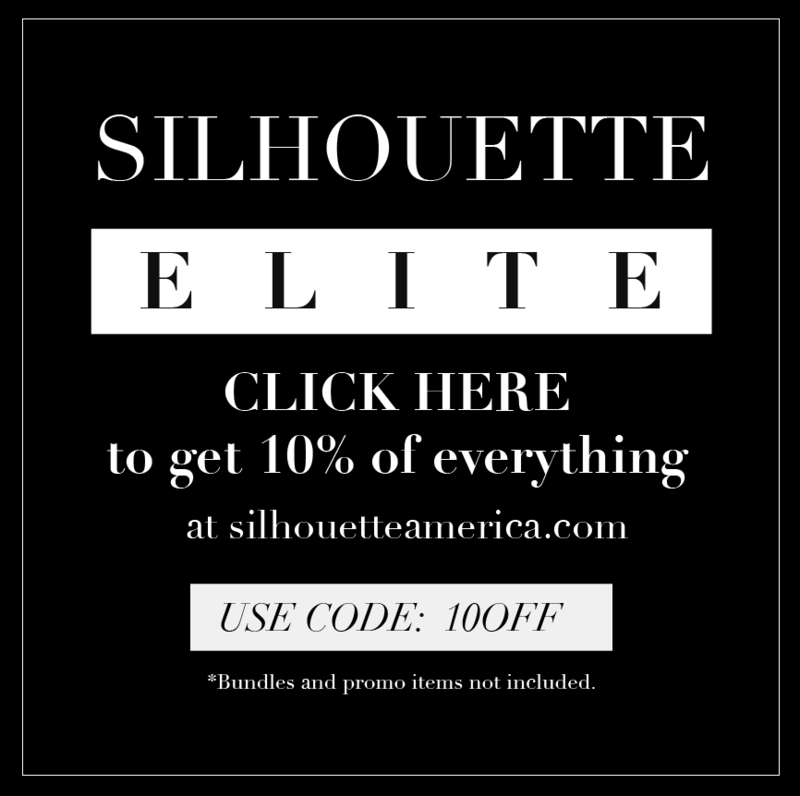 Scroll to the middle of THIS post for instructions. In those instructions I show you how to tie it onto a stuffed monkey which is actually really helpful for kids. Instead of trying to tie the bow tie onto a squirmy child, tie it to a stuffed animal or your leg (anything that is about the same circumference as your child’s neck) first. That way it’s all tied and ready to simply hook around your child’s neck with no fuss. When tying on a mix and matched bow tie, remember that the shorter bow tie piece (in the beginning you pull one side down longer than the other) will be the prominent half. It is the piece that will show up in the front. 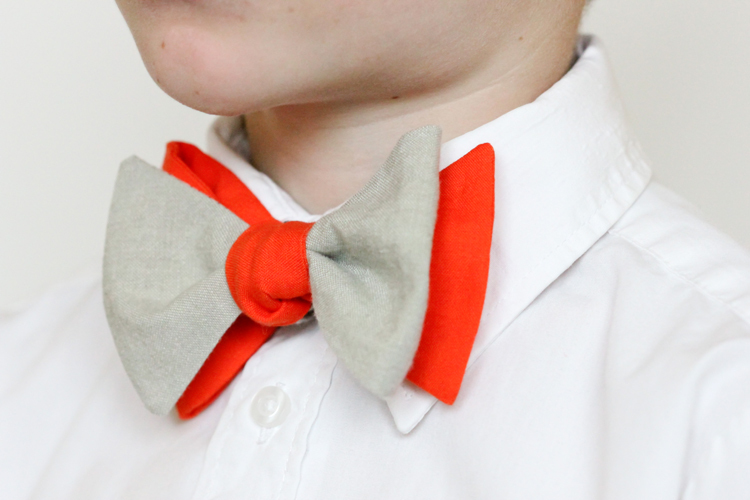 The longer half ends up as the second, accent layer to the bow tie. I found that putting a bolder color as the accent layer looks especially dapper. 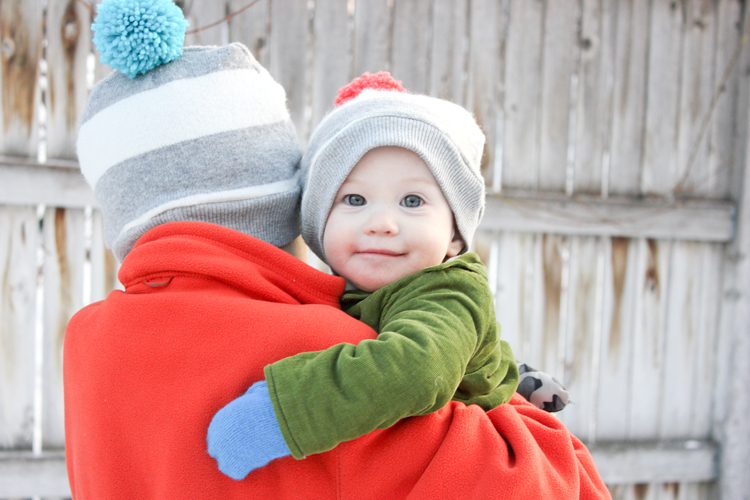 I love seeing in my boys in handmade duds! If I can convince my husband to wear a bow tie, I totally want to try a wool or silk version for him. Wouldn’t a wool version be so yummy? oh my goodness. Those are so cool! Thanks for sharing Annet! And thank you for the tip on the larger hooks. I just added the hook size to the tutorial now. Yes, that would be so frustrating to get the smaller hook! I never thought about mixing. Awesome. 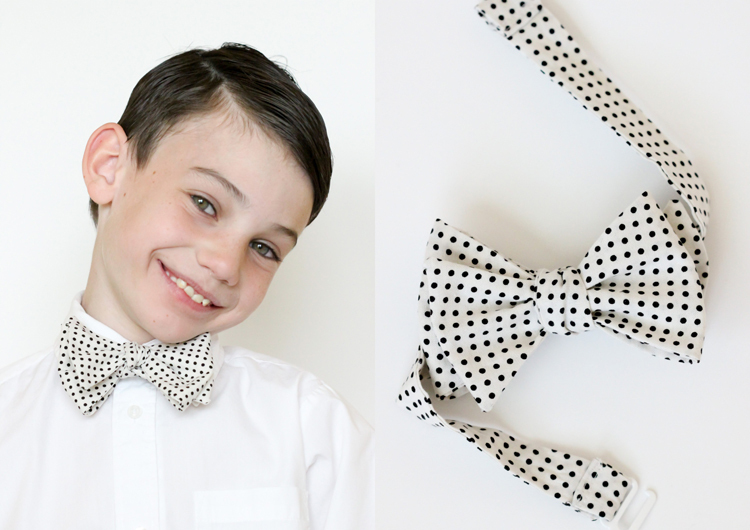 Thanks for the pattern :) I love making bow ties for my boys. I have a suggestion for fabric. I have my dad and hubby save the matching pocket squares they get when they buy ties, then use the pocket squares to make bow ties for the little boys. If there is not enough length I add a loop of elastic to add the difference. Thanks again. That is a great idea! Thank you for sharing! 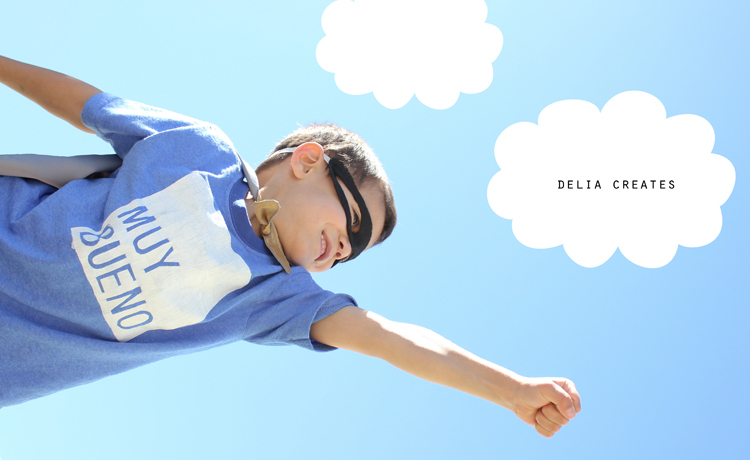 these are awesome delia! love the mix and match, you’re a clever one. thanks for the free pattern! What a handsome guy! These pictures are just so awesome! Thanks so much for the tutorial and pattern. My 15 year old loves wearing bow ties! I love your fabric contrasts. 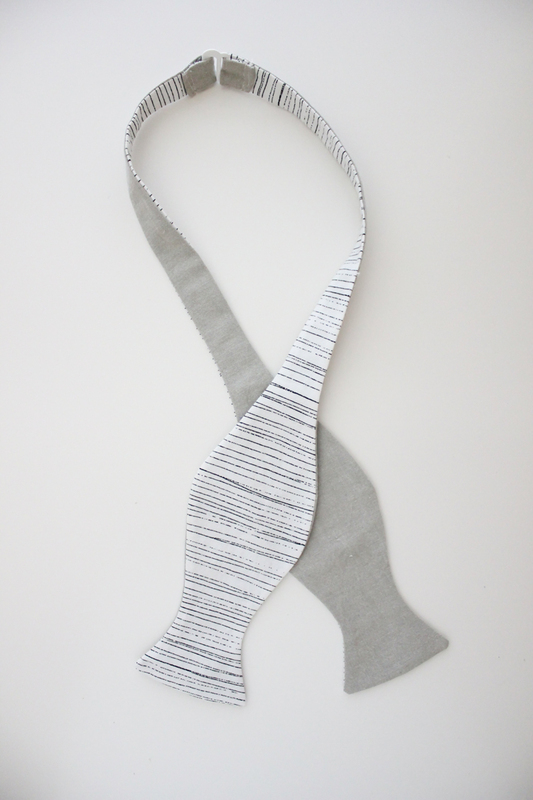 What a wonderful twist on tie wearing! I would’ve never thought to layer them like that. Thanks for the fantastic tutorial! I made bow ties for my son’s wedding last year. I thought I would go insane trying to turn them right side out!!!! Then I discovered that if you moosh in one corner of the tie and stick the pointy end of your chopstick there, you can turn them in a jiffy. Just put the bottom of your chopstick on a hard surface and slide the tie down over it until you run out of chopstick. Keep sliding and adjusting until your tie is right side out; then give it a shake and the chopstick will fall out. Easy peasy and no risk of holes from the pin. Thank You for the Bow Tie Tutorial. Hopefully my grandson might wear one some day! Thank you for sharing the pattern and tutorial! 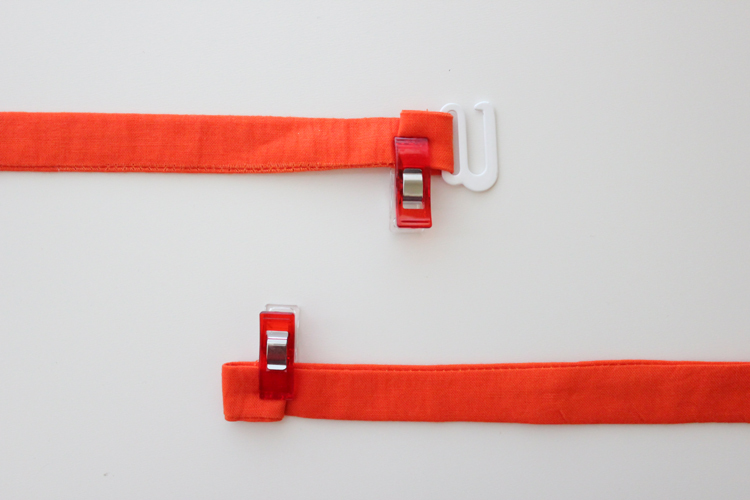 I have a question – I am going to make a few for my 6 year old and I would like to use elastic instead of a clasp. How much elastic should I use? Thanks! I would measure his neck, subtract 1 inch, then divide by two. Use that measurement to measure from about 1/2 an inch from where the bottle neck of the bow tie starts to determine how long to make the strap portion for each side of the bow tie. 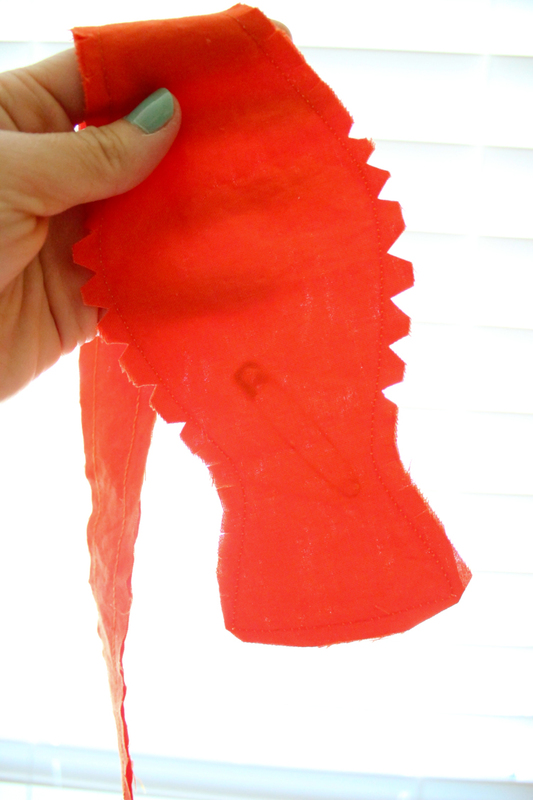 Then use a 3 inch piece of elastic (which after sewing will shrink down to about 2 inches. That should fit him now and grow with him a little bit. I hope that helps! Love this! Made and shared your link! Awesome! I am so glad you enjoyed the pattern! 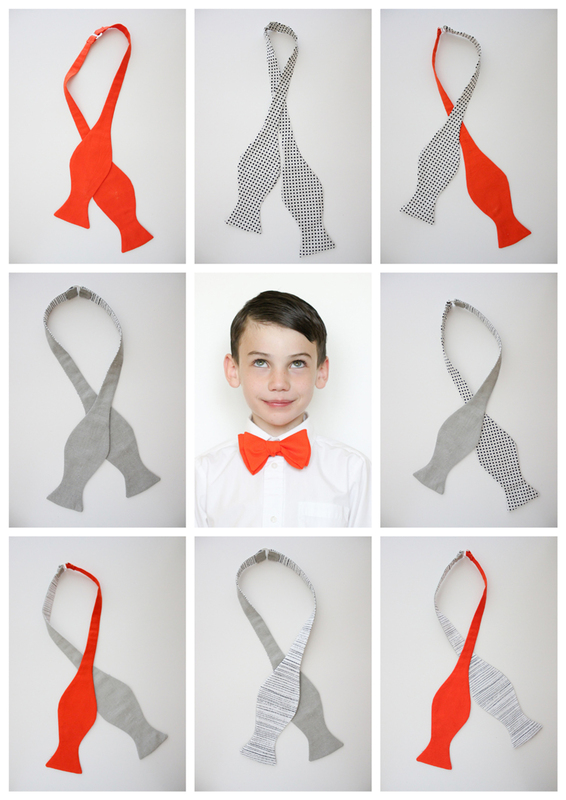 Hi, I would like to make this bow tie for my son who is 15 and husband, would you be able to help as to how to adjust the size of the pattern to fit them? Thank you. HI! Sorry for the delayed response. 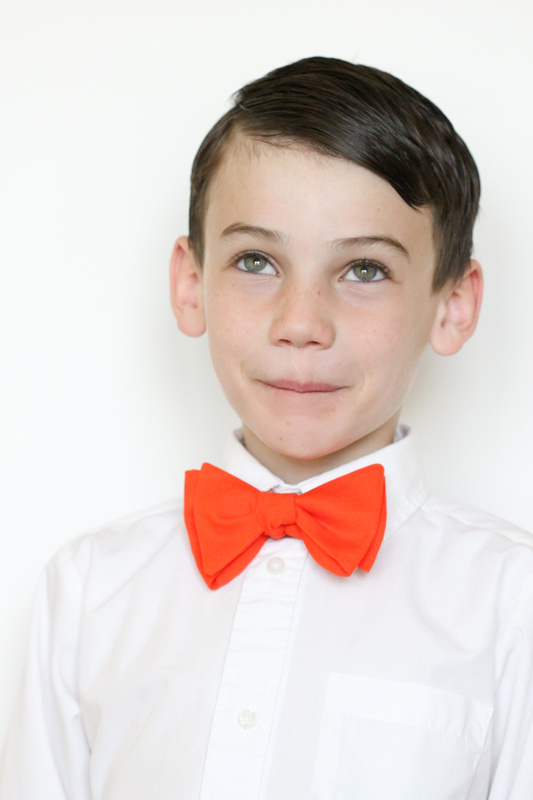 I created the bow tie to look kind of big on little boys, so for older boys and men it should look sleeker and slimmer but still proportional. You just have to lengthen the straight neck pieces to fit. If you want the bow tie to look bigger and not slimmer, than I would simply enlarge it by maybe a 1/4 of an inch along the curved sides. I hope that helps? Let me know if you have more questions. I’m going to be a Grannie and my daughter in love saw some baby moccasins on pinterest that I’d like to make for the baby. I believe the moccasin was supposed to be leather but the Pinterest poster named “bonjourmoon” sewed them using felt. She mentioned your site for the pattern I have searched your site and cannot find the pattern for these particular booties. How can we go about getting the pattern for me? but I don’t specifically have a moccasin pattern. I’m so sorry. 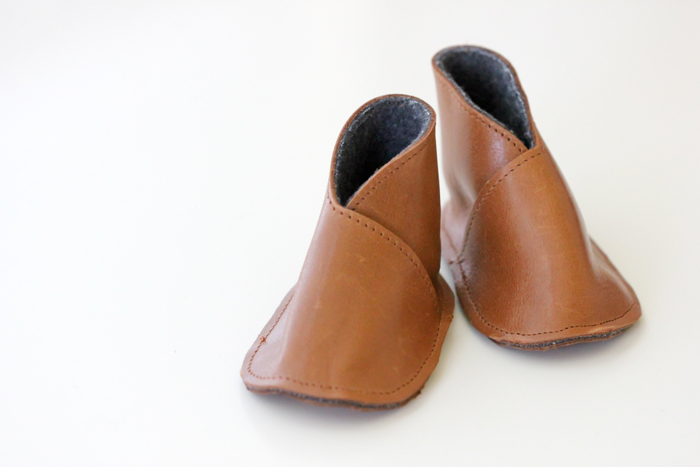 If you really want the moccasin look, I know Peekaboo Patterns has a baby moccasin pattern. I hope that helps! 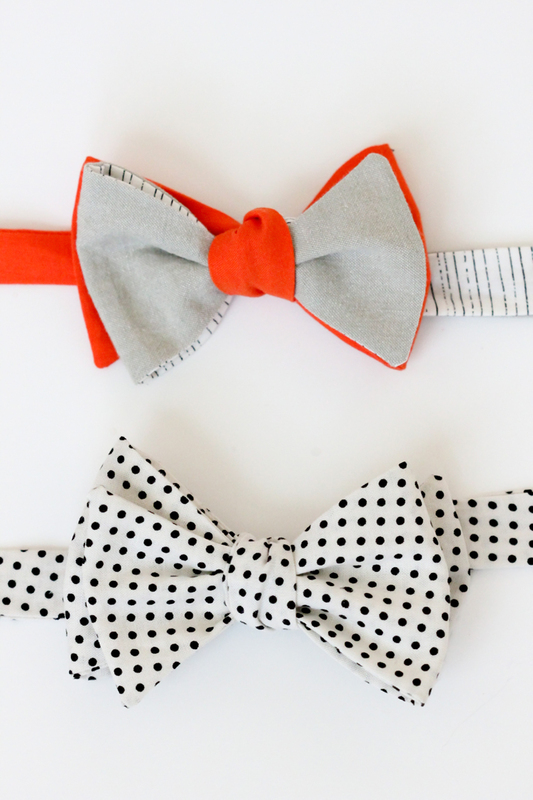 These bow ties are adorable! if I were making for a man should I add interfacing? What keeps them stiff and no flimsy? Yes, a lightweight interfacing would be great! You don’t want it to be too thick or stiff, or it will not tie well. Made a set of these for my three grandsons and they wore them on Easter. They looked so cute from the 2 year old up to the eight year old! That makes me so happy to hear! I bet they were adorable! I’m trying to find a bow tie pattern for toddlers, but am having no luck, so I’m thinking of sizing down you pattern to try and fit. Can you offer a suggestion on how much I should shrink the pattern to fit a (almost) two year old?